Students enrolled in the CEMS MIM at the University of Economics, Prague will soon be able to apply to study at Cornell for their term abroad. The Cornell SC Johnson College of Business will be the first US business school to join CEMS – the Global Alliance in Management Education. The collaboration will provide the opportunity for CEMS MIM students at the University of Economics, Prague, who wish to gain part of their business education from a US Ivy League school. 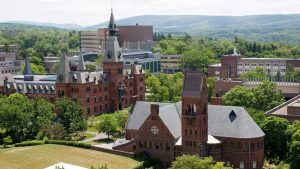 In addition to CEMS students at the University of Economics, Prague getting the unique chance to apply to spend their term abroad at Cornell from August 2020, the University of Economics, Prague will also welcome Cornell students wishing to study in the Czech Republic. The partnership will open up wide opportunities for mutual learning, a better understanding of the US market and culture and the unique chance to engage with US corporate members who have an interest in hiring and developing talent. Students study the CEMS curriculum for one term at their home university, with mandatory study abroad in a different CEMS member school for the first or second term. In addition to a home degree, students complete a business consulting project and internship practice.